Desiree Fairooz was once a full-time teacher. Now she spends her days protesting the war in Iraq. Instead of standing in front of a chalkboard and explaining lessons to her students in Grand Prairie, Desiree Fairooz recently spent some time in Washington, D.C., standing in front of the office of the U.S. Speaker of the House, Nancy Pelosi, explaining her causes to the Capitol Police. No apples for the former Grand Prairie ISD schoolteacher there, only scratches on her wrists left by the thick, white plastic ties that police use as disposable handcuffs. It�s all part of the life that Fairooz has chosen, but one that she has been groomed for. She credits her activism to her progressive-minded aunt and the teachers at her Catholic high school. The arrest occurred while the 50-year-old fourth-grade teacher was taking part in a protest held by the women-initiated national peace group Code Pink. While holding up banners that read �Stop Funding the War� and �Don�t Buy Bush�s War� and chilling images of death and destruction in Iraq, Fairooz and other pink-clad women chanted, sang clever songs, and quipped slogans. 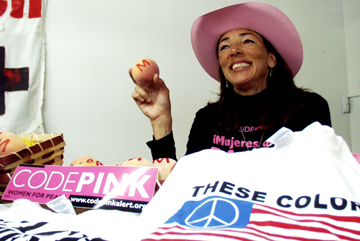 She joined Code Pink about three years ago after seeing photos of women protesters dressed in pink in front of the White House. �I Googled [Code Pink] and found chapters in Fort Worth and Arlington and became involved with them,� she said. Her first action (as each individual protest is identified) took place in March 2005, when she joined other demonstrators in commemorating the second anniversary of the Iraq invasion. In Washington, Fairooz is the �house mom.� She handles reservations and logistics and ensures that visiting members are provided with meals, clean linens, and a witty host. Everything is paid for by benefactors. Without their help, she said, she wouldn�t have been able to relocate to Washington. A recent report jointly produced by Code Pink and Global Exchange, a human-rights organization, described horrendous conditions for women in Iraq, mainly due to infrastructure destruction, insecurity and fear, and restricted access to jobs and education. The report lays part of the blame on the United States and refers to stories told by Iraqi women of being sexually and violently assaulted by U.S. military personnel, especially in detainment centers. �I know what it feels like to be a foreigner in your own country,� she said. Native American, African-American, German, and Irish, Fairooz said she never felt quite accepted growing up and was frequently subjected to racial discrimination. �I remember taking the city bus cross-town to school and being taunted because I was light-skinned,� she said. She remembers how black people thought she was white, and white people thought she was Hispanic � the Hispanic community ultimately accepted her. At a young age, Fairooz� family broke up, and she was separated from her two sisters. She went to live with her grandmother in Los Angeles while her sisters were sent to a Catholic home. She speaks of her childhood with both enthusiasm and sadness. �I felt guilty for many years,� she said of her separation from her sisters. Following high school, Fairooz completed her bachelor�s degree in Latin American Studies at the University of California, Los Angeles. In her junior year, she moved to Mexico City as part of an exchange program offered by the school. After college, she went to work for Mexicana Airlines, where she was able to make good use of her fluency in Spanish and where she met her husband, a U.S. citizen born and raised in Bahrain. She eventually moved to Texas and worked for Mexicana at DFW International Airport. In 1993, Fairooz was laid off after 15 years of service and returned to school to earn a teaching certificate. �I wanted to serve children in the Latino community,� she said. She worked as a children�s librarian for the Fort Worth Public Library for the next five years while earning her master�s degree in library science. �I absolutely loved my job, but I could not fit in my activism,� she said. Fairooz began teaching second- and fourth-graders but realized that her growing commitment to activism wouldn�t fit a school schedule either. Fairooz has been involved with other organizations in the Metroplex such as the Dallas Peace Center and the Arlington Peace Center. She has also taken part in many pre-war demonstrations, marches, and anti-war actions, and has participated in a string of candlelight vigils. Fairooz said she wishes more people would get involved, educate themselves, and demand more coverage on what is happening in Iraq � and insist on the truth. She said that people who criticize what she is doing frequently talk about the need to �get them� in Iraq before they �get us over here.� Yet, she said, �They can�t tell you who �they� are.� She believes this attitude is a result of what she calls brainwashing by the Bush administration, using 9/11 and Saddam Hussein to instill fear in Americans.